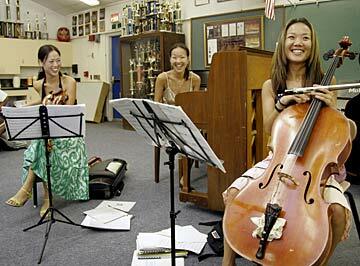 The Ahn Trio -- Angella, left, Lucia on piano, and Maria on cello -- answered questions yesterday about music and their lives during a workshop with Moanalua High School orchestra members. The Ahn Trio performs with the Honolulu Symphony Orchestra at 8 p.m. tonight and 4 p.m. Sunday at the Blaisdell Concert Hall. Call 792-2000 for more information.